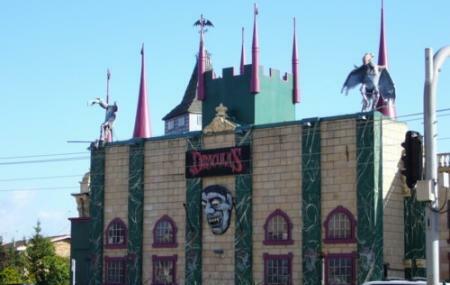 Dracula’s Cabaret Restaurant is Australia’s longest running dinner theatre. It offers the visitors a thrilling experience packed with contemporary music, comedy, theatre, puppetry and fine dining. The three-course dinner offered here features the best of Australian cuisine with flair of madness. Every corner of this restaurant hides a thrill that promises to provide you an unforgettable experience. This one of its kind place attracts people from all over in large numbers and weekend nights here are generally full. Dracula’s 2 hour live production featuring some of Australia’s most talented performers. Check official website for detailed prices. There are special facilities arranged for the people with disabilities. Bus no. 705, 731, 736, 738, 741, 743, 744, 745, 750, 751, 752, 753, 754, 755 and 756. How popular is Dracula's Cabaret Restaurant Gold Coast? People normally also visit Planet Chill while planning their trip to Dracula's Cabaret Restaurant Gold Coast. We paid $130 each for the full VIP treatment and felt it was good value. As a VIP we got to be in a special queue and went in first. The banter started as we waited in the queue with staff in their various states of dress and some amazing make up. We went on the ghost train which brought back childhood memories from the old circuses. The food was excellent - hotel quality - and the drinks were great. The drinks were great... so many different choices and sizes. All up we spent another $100 for drinks and tip. The show was good especially the skit about sperms. We were first timers and enjoyed the banter with our waitress. Yeah F you!!! The show has potential, was entertaining in parts. Food and service was good and some of the staff fun. However the show really lacks any professional appeal. The timings are poor. The two 'heart attack girls lack any real talent or timing. The main artist and singer is very good but the entire performance kills this. The biggest problem, which is incredibly apparent is it's all about taking as much money from each person as possible within a limited time. From Tacky gifts to expensive photos. Its a real shame. The show and it's artists have what it takes but lack both the professional leadership and funding. Would I recommend the show.....not really. Unless they change I see the sun rising on Dracula for the last time. From a man who has travelled, seen many things, I wouldn't bother with this show...well at leadt until it's under new management and investment. I remember going to this place years ago and having a great time, which is why I went back again when holidaying there this time. It wasn't as good an experience. The format just seems a little dated. The humour is mostly none existent. The singing is the kind that would be eliminated in the first round of shows such as Australia Idol or The Voice. The food is not bad, just mass produced with little care. The one saving grace were the "twins" contortionist/aerialist duo performing silks/rope tricks in the air, they were very good. Just a very ordinary night and I am likely not to go again. Excellent night. The hosts were funny, the performances impressive and talented and I loved the waiters all being obnoxious and rambunctious. Picture of the food because you should just go see everything else for yourself. Oh yeah, and the food was absolutely delicious. Some sort of barramundi Thai sauce concoction it was fantastic. They serve stone and wood pacific ale as well which is always a plus. Just go because you will probably never experience anything else like it.